Exceptional townhouse condominium in the Colony Villas at Waikoloa Beach Resort, a gated community on the perimeter of the Kings golf course in the sunny crescent of the Big Island with sunshine 350 days a year. Two pools and tennis courts are on the property, as well as two golf courses, the Beach and Kings Courses. Shopping, restaurants, and grocery stores are close by--everything you might need you'll be able to find within the resort's many shops and stores or at the nearby Waikoloa Hilton Resort. The condominium is sunny, with upstairs and downstairs lanais, two spacious bedrooms, two baths, laundry room, washer/dryer, and full kitchen. High ceilings and island design provide spacious tropical comfort. Great for quiet reading and relaxing or a home base for seeing and exploring the island. A-Bay is the nearest beach, located within the resort, a 20 minute walk. Famed Hapuna, Mauna Kea, and Puako beaches are nearby. Barbecues are located on the property. Many restaurants are located in the resort and the local area. There is an abundance of things to see and do on the Big Island and returning after each day's activities to the space and comfort of a condominium makes the experience so much better. The Big Island is rich in history, culture, and natural beauty. Explore the many beaches, the volcanoes, botanical gardens, the wonderful farmers' market in Hilo, and the soaring terrain of Mauna Kea. 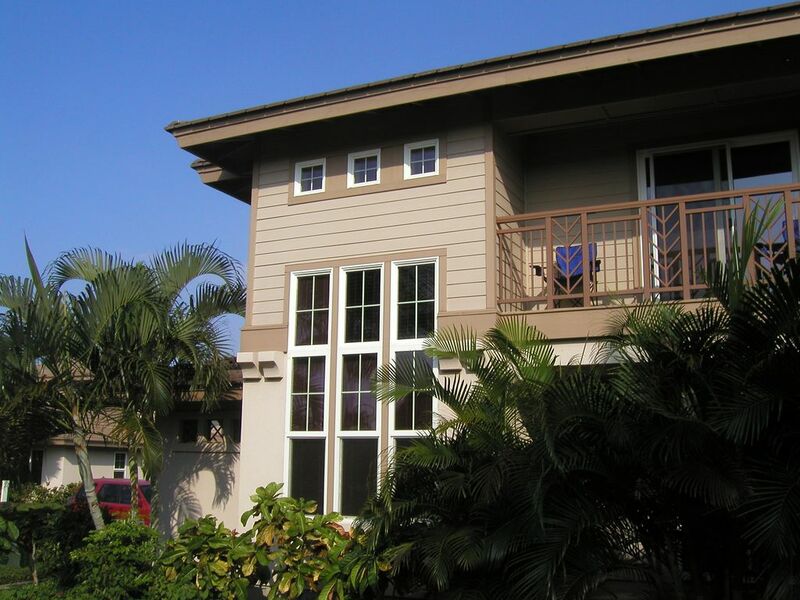 Come and stay in this Hawaiian home and enjoy the pearl of the Pacific, the Big Island. There is no place like it. Over the years we made several vacation trips to Hawai'i and came to love the beauty and tranquility of the Big Island. We liked it so much we decided we wanted a more substantial connection here, so we bought our townhouse condominium at Waikoloa Colony Villas. We were impressed by the landscaping of the grounds and the design of the villas. The property is spread out over many manicured acres, adjacent to a magnificent golf course, with two pools, tennis courts and proximity to all services and retail one might need. The best thing is that these villas are not crammed together and they are all two level townhomes so there is no one above you. We enjoy preparing our own meals. Our condominium has a completely stocked, full-size kitchen which we use everyday when on the island. We like to barbeque so we use the grills frequently. We like to have ample space and with 2 bedrooms, 2 baths, and a garage, our home here in Hawai'i is larger than our condomium in Washington, D.C. Much more comfortable than any hotel, there are never any crowds to contend with, no lines, no tips, no taxis, no add-ons. Just simple living in a lovely place. The pool is 100 ft right around the corner, and Hapuna Beach is just up the road. Can't get much better than that. Large icemaker makes enough ice to fill smaller size ice chest. Full oven with ceramic cooktop, microwave oven, toaster oven, coffee grinder, blender, electric can-opener, toaster, rice cooker. Basic spices, sweeteners, creamers, coffee. New Pots & Pans. Well decorated and lit, for maximum home-like comfort. Nice to make our own coffee and cook dinner. Wonderfully appointed, kitchen, mask & fins, great pool, great hot tub, quiet, clean. A little difficult to find at first in the dark. Numbering in the community difficult. This beautiful quiet condo complex is great for those who like a great location for morning walks. We love the Waikoloa area and the Kohala coast and this condo complex is in a great location to enjoy all of that. Very comfortable lodgings and well stocked kitchen. Paul’s Villa was everything we could have asked for. The location, cleanliness and facilities were excellent. Real nice layout with space for socializing and privacy. The beach towels and chairs came in handy but don’t count on the snorkeling gear, it needs some updating. Great spot to relax. Paul is great to work with! Enjoyed it very much! We were visiting Waikoloa for the last 15 years, once or twice a year and unfortunately it was the worst experience that we ever had with our stay. We stayed at this condo for three weeks. The condo itself in a desperate need of renovation: very noisy plumbing (toilets making sounds, showers doesn't functioning properly); carpet is very old, dirty with the stains all over; air conditioner is very noisy (it's very hard to fell asleep at night because of the noise); from the all light bulbs in the kitchen and eating area only 2 are in working condition; very old beds (bedding, pillows; very hard, uncomfortable and squeaky matrasses); condo has a three TVs, all are really small, just like a computer monitors and on top of it is only one TV on the main floor that is connected to the cable; Cable on that TV is a joke, it has only local Hawaiian channels with no access to Netflix or any decent tv stations or movies on demand; all the utensils in the kitchen were burned and scratched, it was absolutely impossible to cook (owner replaced all the utensils after we have contacted VRBO directly. Prior to that we were trying to contact the owner, but owner ignored our emails, so we had no choice but to contact VRBO in regards to this matter. After VRBO contacted the owner, instead of an apology owner sent to us an extremely rude and unprofessional email calling us the names because we have contacted VRBO and he also wrote to us that he is not expecting any future calls from VRBO during our stay. We have contacted VRBO security department and forwarded to them a copy of that email and all the pictures. The owner of this condo is an extremely rude, obnoxious person who treats guests like annoying flies. There are so many nice condos in Waikoloa that managed by very nice people, so do yourself a favor - book a condo that is in a good condition with somebody else who will treat you as a valuable guest with dignity and respect and appreciate your business. The condo is an excellent value for the amount of space and location to activities, dinning and shopping. The property does not offer an island view but is very comfortable for 2 couples to share and the kitchen is excellent. The TV's in the bed room didn't work but who needs TV in Hawaii. The property has 2 pools and a small workout room. Remember to pick up the little items like shampoo, soap, paper towels and trash bags.... Overall we really enjoyed our stay at Waikoloa. Within the resort, the Hilton resort hotel offers many activities, restaurants, and special attractions such as concerts throughout the year. The Queens Shops and the Kings Shops have a wide variety of retail stores, including a Macys. There is a grocery store in the Queens shops which is a great convenience.